We wanted the Advocate to showcase the technical expertise our network of contributors has demonstrated for years paired with a modern, clean look that’s easy to navigate. It also had to support multiple forms of content: articles, photos and videos. Emily and the Visible Logic team gained a deep understanding of our content and our organizational goals and helped us achieve a design that’s catching eyes in our industry and giving us a strong identity as we transitioned our publication from print to online. We now have an attractive website that’s easy to maintain and update. 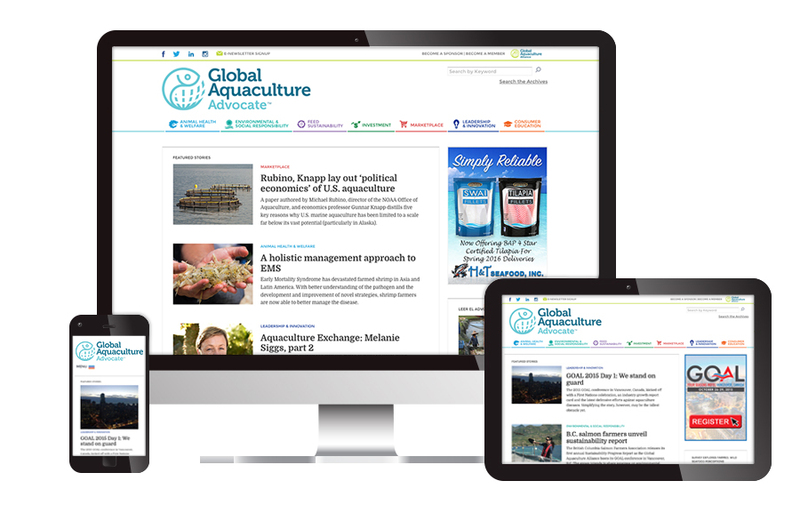 The Advocate is the Global Aquaculture Alliance’s news outlet. It features industry news relevant to the hundreds of individuals, associations and businesses associated with aquaculture and seafood around the world. The GAA is an international, non-profit organization committed to feeding the world through responsible, sustainable aquaculture. The Advocate has been the source for sharing information from the organization and the entire aquaculture industry. The Advocate needed to change from a printed trade journal to an online news site. After more than 15 years as a bi-monthly trade magazine, GAA wanted to move the content online to make it more accessible, timely, and to help drive traffic and support for GAA’s universal goals. The Advocate is now a robust news site featuring content that is updated on a daily or weekly basis. 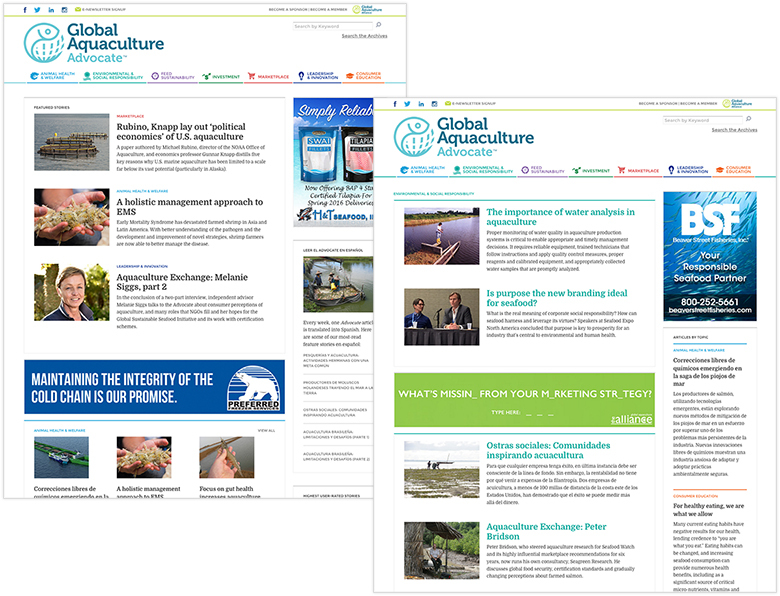 It continues to share the research of aquaculture’s leading scholars as well as interviews and analysis of trends in the marketplace and reports of news and discoveries from around the globe. The design, colors and graphics were designed to connect with GAA’s parent web site (which Visible Logic had redesigned several months earlier). However, the site has dense content and the typography, imagery and overall layout were carefully considered to create an easy-to-read design that is more contemporary than the print version and would look good on all devices from desktops to tablets to phones. The engaging design highlights the content. The color-based system was designed to assist users in finding the content that is most relevant to them and to organize content categorically. The WordPress-based site features a custom-built theme. Editors are able to easily upload and format content. Specific news stories can be featured on the home page, and an online ad management tool controls the placement of ads throughout the site. Readers are able to rate their favorite stories and the homepage features lists of highest rated and most-read content. The content now reaches the GAA readership (14,000 on the weekly newsletter subscription list) in the blink of an eye, as opposed to weeks or even months in traditional shipping channels for print publications. The Advocate now accounts for about one third of GAA’s robust web traffic. Having their news online has helped organic search results and allowed GAA to increase their social sharing. It’s also become a valuable tool for attracting new members to the organization and furthering their mission of advocating, education and demonstrating the need for responsible aquaculture practices worldwide.